Dong Quai for Menopause Isn't Working? Are There Alternatives? Known as the “female ginseng”, dong quai has gained popularity in recent years for its reported effectiveness in treating menopause symptoms. But when this treatment doesn't work, are there other easily obtainable options that won't require risky and expensive hormone replacement therapy? Keep reading to learn more about alternatives to dong quai. 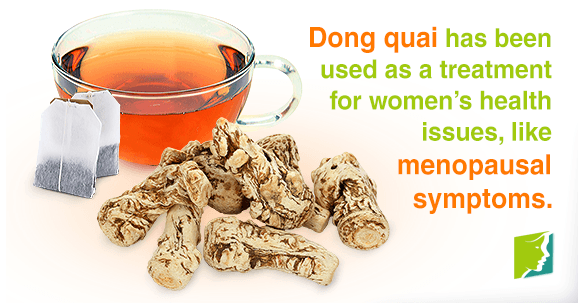 Also known as the “female ginseng”, dong quai has a long history in East Asian medicine for treating women's health issues, including the symptoms of menopause. Today, its popularity has grown throughout the world. Many women today turn to dong quai for relief from their menopause symptoms. This is due to the herb being a natural remedy that can be taken without the side effects that can occur from taking prescribed medications, such as hormone replacement therapy (HRT). Is Dong Quai Right for Me? Exercise and diet. Eating right and exercising regularly aren't just good ways to stay healthy, they're also a good method to relieve the symptoms of menopause. Many of the direct symptoms of menopause such as stress, weight gain, and fatigue can be relieved by regular exercise. What's more, exercise and a healthy diet can help relieve estrogen imbalance, a primary cause of menopause symptoms. Soy. Filled with proteins, this healthy legume has long been used as an alternative to meat products. For women going through menopause, it can also be used as an alternative to HRT. Soy contains phytoestrogens, plant-based compounds that mimic estrogen in the human body. For menopausal women, this means that the plant can help balance hormonal levels during a time of often painful transition. All women experience menopause differently. That's why it makes sense to talk to your medical professional about your menopause symptoms and how to treat them best. An expert can analyze your unique symptoms and give you recommendations on how to find much-needed relief from menopause symptoms. Want to know more? Click on the following link for more information on other ways to cope with menopause. Cutting caffeine from your diet is recommended for all menopausal symptoms. Follow this link to find out more.